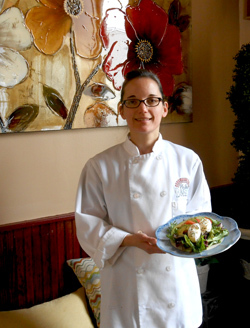 Chef Danielle Sanders considers herself a "from-scratch type of girl." That means almost everything from the delicious pastries to the dressing on crisp salads at the Red Brick Bakery and Tea Room in Red Lion is freshly prepared. "I really feel if I can&apos;t do it right from scratch, we don&apos;t put it on the menu," Sanders said. "That really guides a lot of what we try to do at the shop." And that&apos;s plenty. What started out as a bakery and tea room has blossomed into a broader restaurant, where customers can enjoy an upgraded breakfast menu, 15 salads and sandwiches for lunch, and standout scones and a rich creamy vanilla bean cheesecake for dessert. For an exquisite dining experience, Sanders offers a seasonal Chef&apos;s Table experience, a four-course meal perfect for a night out. This spring&apos;s menu features entrees of roasted salmon with fennel and Pernod or a coffee and molasses roasted pork tenderloin. The Chef&apos;s Table occurs twice a month with menus that rotate seasonally - partly because Sanders doesn&apos;t like to repeat items, but also because she likes to challenge herself to cook something new. "I didn&apos;t know how to make beef Wellington before I put it on the Chef&apos;s Table menu," Sanders said. Sanders&apos; foray into the culinary world began when she and her husband bought the Red Lion Bed & Breakfast in 1999. With no formal training, she started hosting private events and dabbling in catering through the B&B, but eventually went to culinary school. A couple years later, she was working as a culinary instructor while hosting tea parties at the bed and breakfast a few times a year, mostly to help get the word out about her business. Eventually, it was no longer a marketing push. Customers just wanted to come there for tea. "I finally just said, ‘You know what? I need my own kitchen,&apos;" Sanders said. So, on Feb. 19, 2005, Sanders opened the Red Brick Bakery & Tea Room on Main Street in Red Lion. The tea parties hosted at the B&B paid off, as the new venture had an instant customer base. The line stretched out the door all morning, and the bakery only grew from there. More than 11 years later, the restaurant is humming along, with a full-fledged menu. Five Chef&apos;s Tables are planned through June, and Sanders has special teas planned for Mother&apos;s Day weekend. She&apos;s experimenting with new gluten-free recipes, offering a scone and muffin each day. They, of course, are made from scratch, at the historic building that has grown from a bakery and tea room into so much more. "What it started as is not even close to what it is now," Sanders said. "It&apos;s interesting to see the business grow and take on a life of its own." You can try you own hand at from-scratch cooking with the recipe below (taken from the current Chef&apos;s Table menu) before visiting the Red Brick Bakery & Tea Room to taste the real deal the next time you Explore York. Pour enough water into a 10-inch nonstick skillet to measure no less than 1 1/2-inches, place over medium heat and bring to slight simmer. Add the vinegar. Gently crack each egg into a custard cup. Lower each cup into the water until it touches bottom and gently pour in the egg. Cook for 4 1/2 minutes, adjusting the heat to maintain the temperature. Remove the eggs with a slotted spoon, 1 at a time, to a tea-towel-lined plate. Trim the edges of the white with the side of a spoon and serve immediately. Eggs may be stored in ice water in the refrigerator for up to 8 hours. Reheat in hot water for 1 minute before serving. Add the sweet onion, brown sugar and butter into a medium size sauté pan. On medium heat, stir the onion occasionally until onion is caramelized (dark brown color). Pulse onion in a food processor just until finely minced. Add sugar and next 3 ingredients; process until well-combined. With processor running, add oil in a slow, steady stream. Taste and adjust seasoning as necessary. Transfer to separate container and hold dressing until ready to serve. Divide mixed green between 4 plates. Top with avocado and tomato slices. Lay 2 poached eggs on top of avocado/tomato slices, sprinkle with parsley flakes (if desired) and drizzle with sweet onion dressing. Curried Crab and Asparagus Bisque at oak. 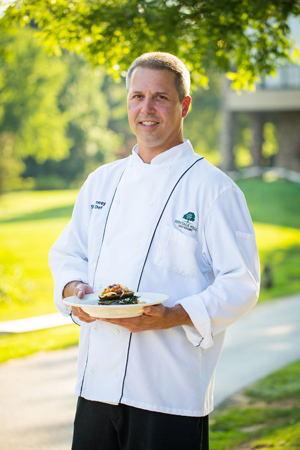 Shawn Conway, Executive Head Chef of oak., began his career in the kitchen at a young age and developed his skills through many years in the restaurant business. He comes from an experienced culinary family, as his grandfather owned a restaurant in York and his uncle was a chef in the U.S. Navy. While studying art at Penn State University, Shawn turned to cooking as a way to express himself and emerged in the industry with a passion for food. His career path has taken him to various locations on the East Coast including The Mirage, The Left Bank, The Glen Rock Mill Inn and most recently, Bistro 19. He helped design and open both Pol-i-tesse and Café Sol in Harrisburg, created and directed the culinary team and operations at Juliana&apos;s Italian Restaurant in Mechanicsburg, and worked as the personal chef for the Lieutenant Governor of Pennsylvania. Shawn also worked in south Florida, where he was the Executive Sous Chef at The Club at Boca Pointe. He not only was in charge of the catering department, but also the daily operations of the two restaurants within the club. Shawn has a distinctive global influence and incorporates many different styles and techniques. He especially enjoys cooking Italian and Mediterranean cuisine and working with fresh and unique ingredients. His dedication and passion for food allows him to make dishes that are creative and inspired. In his free time, Shawn enjoys being with his children and golfing. Try this oak. recipe for yourself at home, and then come for the real deal and an exquisite meal the next time you&apos;re in town to Explore York. 1. In a sauce pot, sauté asparagus, carrots, onions, celery and garlic in oil until soft. 3. Add water and base and stir thoroughly. Make sure all spices are off sides and bottom of pot. 4. Bring to a boil and reduce to simmer. Remove from stove and puree with immersion blender or standard blender. 5. Place back on stove, add cream, half & half, coconut milk and Sriracha and return to a simmer. 6. Add roux (flour and butter mixture) and whisk thoroughly. 7. Cook additional 15 minutes, stirring often. Bar Manager Ryan Mapes and Bartender Ashleigh Schwartz have more than 13 years of combined experience working together and creating the eclectic cocktail menu at The Left Bank Restaurant & Bar in York. From the stalwart Ruby Red to a pushing-the-envelope shrub, the vinegar-based concoction on this fall&apos;s menu, you&apos;ll go away happy from this long-lasting icon of York&apos;s restaurant scene no matter what your taste or thirst is for culinary adventure. "We&apos;re always pushing to see what we can do," said Mapes, who has spent his career in the service industry and loves the social and competitive "sport-like" aspects of what he does each day. Mapes also said he thrives on the creative nature of his job, yet loves bringing in his efficient nature. If a great drink takes 45 minutes to make, then it&apos;s not going work on the Left Bank&apos;s menu, he said. At the same time, care is taken to pair drinks with the amazing seasonal food flavors coming out of the restaurant&apos;s renowned kitchen. From an inherited list of approximately 50 cocktails, including the Ruby Red, the menu now features a signature 120 series drinks Left Bank has created and that have found a permanent place on the list due to their popularity. The name of the series plays on the Left Bank&apos;s address of 120 N. George St. Seasonal and more adventurous cocktails are also included in what patrons will see when they step up to the bar at any given time of the year. 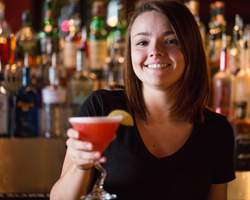 Schwartz employs her culinary training and background, which is perfectly suited to bartending because both deal in the art of making flavors work together. "It&apos;s always fun to make something, and have someone like it," Schwartz said. Still, the Ruby Red tends to be the recommended drink for patrons coming into the bar who don&apos;t know what they are in the mood for, or who don&apos;t have a favorite type of cocktail already. It&apos;s well balanced - not too sweet and not too strong - and it&apos;s a favorite among a good portion the Left Bank&apos;s staff, too. Try this Left Bank classic for yourself at home, and then come for the real deal and an exquisite meal the next time you&apos;re in town to Explore York. Fill mixing glass with ice, pour your spirits and mixers, squeeze lime and place shaker tin on top. Shake vigorously and strain into a chilled martini glass. The John Wright Restaurant&apos;s Local Grass Fed Short Rib with Heirloom Smoked Gouda Grits is what Executive Chef, Director of Operations and Partner Jim Switzenberg calls "the best dish we&apos;ve put on the menu." 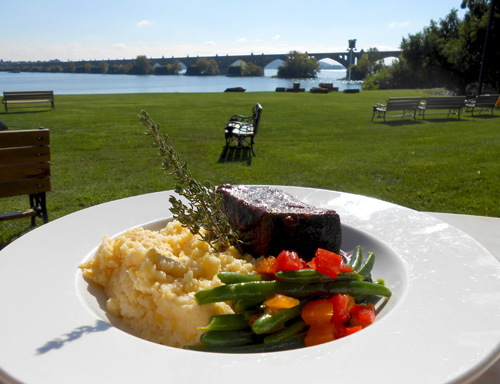 And that&apos;s saying something for this culinary delight along the beautiful Susquehanna Riverfront in eastern York County. The selection is a seasonal dish on the menu for just fall and winter. Every time it goes off in the spring, people ask for it - so order while you can in the coming months. Or, if you want to try an at-home version of this creation, the recipes are below. After coming back to his native Central Pennsylvania following executive posts in restaurants in New York and Los Angeles, Switzenberg latched onto the waterfront view and access to so many fresh ingredients available from local farms to forge one of our region&apos;s great dining destinations. One of the most unique aspects of what you&apos;ll taste when you order this dish at the John Wright Restaurant is artisan grits, which also gives patrons as sense of how deliciously "fanatical" Switzenberg is about sourcing his ingredients to create delicious food for you. These grits are a variety rediscovered in South Carolina about 20 years ago and date to the 1700s, complementing locally sourced beef and cheese on your plate straight from Central Pennsylvania. "It is so tender, and at the same time so beefy," Switzenberg said. So, try the recipes for yourself, and then come compare with a getaway this fall or winter that includes dinner at John Wright Restaurant - amid an amazing culinary exploration across all of York County, PA! 1. Cut beef in 4 equal pieces season with salt and pepper. 2. Sear beef in a brazing pan with canola oil until dark brown. 3. Remove beef and add vegetables and cook until caramelized. 4. Add tomato paste and cook for 3-4 minutes. 5. Add wine, herbs and return beef to pan, cover with lid and simmer for 1-1 ½ hours until "fork tender." 6. Strain liquid and serve. 1. Stir grits and water vigorously and allow to settle for 5 minutes. Remove any hull or debris that has floated to the top. Let sit at room temperature for at least 12 hours. 2. Bring grits and water up to a slow simmer stirring constantly for 15-20 minutes until tender. 3. Season and add butter and cheese.